TROYE SIVAN RELEASES NEW SINGLE AND VIDEO - "MY MY MY!" Troye Sivan said, "'My My My!' is a song of liberation, freedom, and love. Throw all inhibition to the wind, be present in your body, love wholeheartedly, move the way you've always wanted to, and dance the way you feel - hopefully even to this song!" His new album will be released by Capitol Records in the spring. Hand-picked by designer Pierpaolo Piccioli, Troye is the face of the Valentino Spring 2018 menswear advertising campaign. "My My My!" 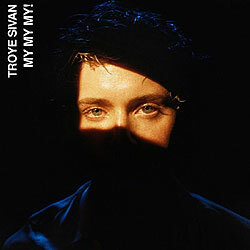 - the first single from Troye Sivan's upcoming album - is now available for download and streaming HERE. The accompanying video, which was directed by Grant Singer (Lorde, The Weeknd), can be seen on Vevo (shown above). Blue Neighbourhood (Capitol Records), Troye's 2015 debut album, topped the iTunes charts in 66 countries. It has sold more than two million adjusted albums worldwide and is certified Gold in the U.S. Streams across all platforms exceed one billion while video views have surpassed 500 million. The New York Times hailed Troye as a "prototype for tomorrow's global pop star." The young Australian artist has appeared on the covers of Rolling Stone, Out and V Magazine. Associated Press named Blue Neighbourhood as the No. 1 album of 2015. Rolling Stone awarded it four stars and observed, "At its core, Sivan's soft and honeyed vocals command attention, filled with the kind of heady and unchecked emotions that can only be mustered up by someone at age 20." Early in his career, TIME named Troye as one of the most influential teens. His numerous awards include a Billboard Music Awards trophy and two GLAAD Media wins. Troye's Blue Neighbourhood trilogy of videos, which chronicled the childhoods of two working-class boys whose romance is stifled by intolerance and abuse, was honored with a 2016 MTV VMA nomination for breakthrough Long Form Video. The single "Youth" claimed the No. 1 spot on Billboard's Hot Club Play chart and has been certified Platinum in the U.S.